Even though I’ve been riding to work every day, I haven’t felt too inclined to write about it, for one simple reason: I easily fell back into the commuting routine. Aside from a little rain the first week, it’s been smooth sailing. However, the past couple of days have been a little more interesting. Yesterday, I arrived at work to find that one of my panniers had fallen off. I wasn’t sure where I lost it, but I needed it, so I turned back. Naturally, I found it only 1/4 mile from my apartment. This meant I rode all the way to work, nearly all the way home, and back to work again, making my ride to work nearly 9 miles, instead of around 3. This, of course, meant I was late. This morning, it was in the lower 40s and absolutely pouring outside. I planned for this and brought a dry change of clothes, but it’s still never fun to arrive at work drenched. I have another camping trip, and some hiking, to write about, but I haven’t been able to find time for that yet. I saw a guy on a bike riding the wrong way down a one-way street, with no helmet, riding with no hands, sending a text message on his cell phone as he rode. How has he not Darwined himself out of existence by now? I’m not very fond of Christmas. The pervasive sense of materialism combined with obnoxious Christmas carols for a good month leading up to the holiday leave me with a foul taste in my mouth. Fortunately, the materialistic part doesn’t really apply to my family, but it’s especially unavoidable this time of year overall. And I’m an atheist, so the religious aspect of Christmas doesn’t apply or appeal to me, either. 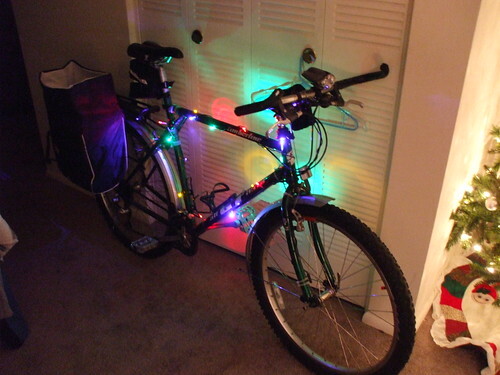 However, I put some Christmas lights on my old mountain bike. Does this make me a fraud? Sarah says no, but I’m not so sure. I feel a little weird riding around with the lights turned on. So far, they’ve attracted nothing but positive attention in the form of a few people shouting, “I like your lights!” as I ride past. And truth be told, I don’t completely hate Christmas. I like the time with family. That’s what it’s about to me. I like the lights downtown by the square and tastefully-done lights on people’s houses. 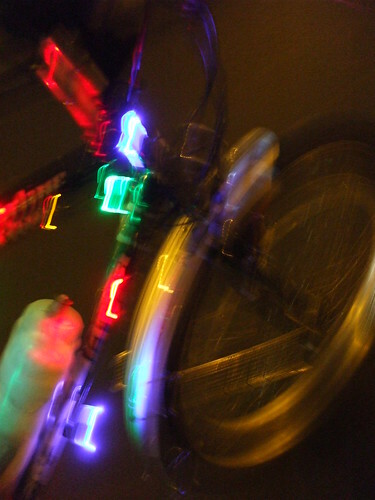 Basically, when you get down to it, I like things that light up, and I like putting things on my bike. So I put the lights on my bike. Does this make me a fraud? Side note: one nice side-effect of the lights is that they make me much more visible on the road. I like to think of them as a safety feature.